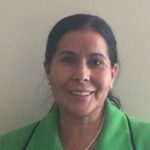 I am Paula, an immigrant woman from Bolivia, who has been a member of Mujeres Unidas y Activas since 2015. The most valuable lesson I have learned at MUA is to respect others and to offer lots of love to my peers. As an immigrant woman, MUA has helped me come to know my rights and to not remain silent when they are not being respected. My hope is to leave the past behind, fight for my present, and to continue nourishing myself with wisdom so that I may help other women.